As a child on holiday in Malta, I used to gaze mesmerised at the women in doorways who sat flipping bobbins of white thread over and under each other, from which a miraculous trail of lace flowed and was pinned above on a padded board. 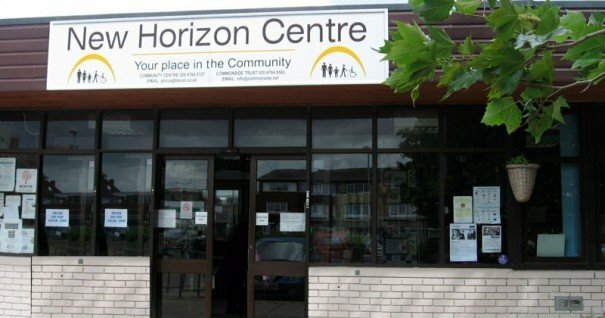 Most people we meet know about one or two activities that take place in our community centre, the New Horizon Centre. That’s the thread: one of many threads leading to an interwoven lace pattern at the centre. Not so many people are as lucky as me to be able to see the whole picture as it develops. This analogy goes some way to explaining why although I have been Director of the Commonside Community Development Trust since November 2005, I have never once got bored and I haven’t felt the need to move on to new challenges. Every day here IS a beautiful, rewarding new challenge with tears, laughter, tragedy and hard-won progress. All of those things, every day. All human life is here, in the New Horizon Centre, seven days a week, 52 weeks a year, from at least 8.30am to 10pm daily. 52 free Sunday lunches for the homeless and vulnerable. In all of these activities, there are groups of people taking part and bringing into the centre their questions, problems, weariness, suggestions, energies and talent. I think, for every one person who comes in with a problem, or as quite often happens, a complexity of tangled and exhausting problems, at least three people come in with an offer to help or improve our community. They volunteer, they offer feedback, (sometimes brutal feedback!) and by taking part in our activities, they enable us to learn what does or doesn’t work well and to identify our path for the future. There is no job more rewarding, challenging, frustrating and inspiring, which is why I am still here! This week, we are running our ever-popular Mediterranean Night on Friday 12th April – £15 for some beautiful home-cooked food and a Greek-themed disco! Freedom of Movement will NOT be a problem at our event. Any surplus we make will be put straight back into running our community projects – the lunch club for older people or the Step Forward support programme for parents. Next week the Lunch Clubbers are having an early Easter lunch with local children. Old and young will eat together and then solve the clues that we have set to enable the children to find hidden Easter eggs. They will only find the eggs if they work together! That’s intergenerational egg hunting! In May we are planning to take a group of older people to Canons Leisure Centre for the day, with carvery lunch included. And our plans for the summer holidays are under way, with a big boost from our friends at Paul Strank Roofing, we are holding a special free fun day for all local residents with special visitors from Deen City Farm and Mike’s Donkeys on 3rd August. Watch this space! I watch it every day and it’s much better than TV. P.S. We do have some gaps in our diary. Please fill them with your private bookings for parties, christenings, name days, retirement gatherings, staff outings and all celebrations of life. We have a number of flexible spaces for hire including the Main Hall, Craft Room, Front & Middle Rooms and more. Click on the links to see further images of these spaces, and enquire about your bookings via email or phone. You can keep up-to-date with the Commonside Trust via their Twitter , Facebook and on their website.